“Change is the only constant” applies most aptly in case of insurance buying trend in India. During the time of our parents, traditional plans like whole life insurance, money back, Endowment Insurance and pension plans ruled the roost. However, post launch of ULIP insurance plan in India, it has become the favourite insurance plan for the millennial. Insurance Regulatory and Development Authority of India (IRDA) data substantiates the above fact as the first year premium collection by ULIPs grew by 12.62% in the FY 2015-16. Total premiums collected by ULIPs jumped to Rs 46,871.58 Crores in FY 2015-16 against Rs 41,617.80 Crores in 2014-15. ULIPs premium contribution is about 12.77% to the total life insurance industry premium collection in India. ULIP is a market-linked Insurance product that combines the two concepts - investment and insurance - into one product. ULIPs are market linked products and offer you the flexibility to invest in equity, debt portfolios or a mix portfolio depending upon your risk profile. Therefore, if you are looking to earn higher return on your investments while keeping yourself insured then ULIP could be the most preferred choice. When you buy a ULIP plan, you pay the premium just like any other insurance plan. However, unlike other plans where you do not know how and where your money is invested, the premium paid in ULIPs are invested in a fund of your choice after deducting the charges for fund management, policy administration and mortality charges etc. The value of each unit of a fund is determined by dividing the total value of the fund's investments by the total number of units. There are various types of ULIPs and therefore while selecting one for you, you must look at the charges. Lower the charges mean more investment in the fund of your choice and thus more returns. For example - Somnath buys a ULIP for annual premium of Rs 75,000 for 20 years; the plan will give him a life cover of Rs 7.50 Lakhs (as it should be of minimum 10 times of the annual premium as per IRDA rules). After total charges (assuming 3%) are deducted say Rs 2,250, the amount of Rs 72,750 (Rs 75,000 – 2,250) is invested in the fund chosen by Somnath. Suppose the fund NAV is Rs 11.75 on the day Somnath invested, so he will get 6,191.49 units(Rs 72,750/NAV of Rs 11.75). Somnath found that after one year NAV has appreciated to Rs 12.90, therefore,his total fund value increases to Rs 79,870.22 (6,191.49 units x Rs 12.90). Similarly, if the fund NAV decreases the total fund value would decrease. While buying ULIPs selecting a fund of your choice is the most important step. Life insurance companies offer you variety of funds to choose from. You should choose a plan according to your risk appetite. Let us see how? – As the name suggest equity funds invest primarily in the equity markets and follow an aggressive fund management strategy. The risk adjusted returns of equity funds as an asset class is the highest and most suitable if you are looking for long term wealth creation while taking high risk.Companies even allow you to choose between various type of equity funds, like – Large cap, mid cap and diversified equity funds. The large cap fund portfolio could be suitable if you want equity returns with a slightly lower risk. If you want to take slightly higher risk, mid cap funds could be the best choice. In case you want to enjoy return across various sectors or market cap, then diversified equity funds could be a good choice. – If you think investing in equities is risky then you may follow a conservative investment strategy by choosing the debt fund portfolio. These portfolios invest in various debt instruments, bond market and Government securities and hence carry no risk or the lowest risk. Unlike equities, the returns from these funds, as obvious are also conservative and low. Therefore, it is an ideal choice for conservative investors. – You can choose a balanced portfolio in case you want to enjoy the returns of both equities and debt. Here the fund manager takes a middle path by investing in both the asset classes and follow a moderate risk investment strategy. As the risk is moderate the returns are decent as it is superior to debt funds and lower than equity funds. If you are a moderate risk taker, this could be a good choice. ULIPs provide switching facility between the different fund portfolios. For example – You have chosen equity funds at the start of the plan and your portfolio appreciated substantially after few years. You may like to book profits by switching all or part your unit holdings to debt funds to ensure that the profit is locked. Most companies allow free switching facility upto a specified number of times in a year. You invested in a ULIP when you were young and were willing to take high risk and therefore chose the equity fund portfolio. After certain period of time, you do not want to take much risk and therefore can shift profit of the portfolio to balanced funds. Further, assuming you are nearing your retirement and do not want to take any risk with your investments and thus can decide to switch your entire holdings to debt funds. The idea of rebalancing your asset allocation is to ensure that you do not continue to take unnecessary risk as you are ageing. ULIP helps you in that! When we think of systematic investing, mutual funds come to our mind first. What you probably do not know that like mutual funds, you can also invest systematically in ULIPs by paying the premiums month or quarterly. Investing systematically benefits you in rupee cost averaging while riding the market volatility in a disciplined manner. Insurance cover in ULIP is expressed as a percentage or multiple of the premium paid. As per current IRDA guidelines the insurance company has to provide minimum 10 times life cover of annual premiums paid. Thus, the minimum life cover promised under ULIP is guaranteed to be paid to your nominee in case of your death. As we mentioned earlier, the premiums you pay is subject to deduction of policy administration charges, mortality charges and fund management charges etc. The insurance company sends you an annual account statement showing how they have adjusted these charges from the premiums you paid along with number of current unit holdings and the valuations. You can also see or download this statement by login to the insurance company website. Unlike other Insurance plans, ULIPs allow you to partially withdraw from the funds after completion of 5 years of the policy. This helps you meet your emergency expenses if the need so arises. ULIPs provide the unique facility of making additional investments into the plan through this facility. This helps you allocate more money to ULIPs at a time when you find that the market is at low level or invest the surplus amount which you might get suddenly. Like any other Insurance plans, premiums paid in ULIPs upto Rs 150,000 in a FY qualifies for tax deduction under Section 80C of the Income Tax Act 1961. Since ULIPs are insurance plans, the gains and maturity proceeds are also tax-free under Section 10(10d) of The Income Tax Act. However, to avail the tax benefit, you must check if you have got life cover of minimum10 times of the annual premiums paid by you.There are also no taxes for switching within the funds or partial withdrawal after 5 years. By adding riders like critical illness, accident benefit and sickness you can actually customize the ULIP plan. These riders can be availed by paying a small premium. Do check if the ULIP plan you are taking offers these riders or not! Online ULIP plans usually have lower premium allocation charge as no commission is paid out to any intermediary. However, you should opt for this only when you understand the plan fully well and able to do everything yourself without any help from others. You must have realized why and how ULIPs have emerged as the most preferred choice for the insured. ULIPs ability to deliver market linked returns which is much higher than that of traditional plans like fixed deposits etc. coupled with adequate life risk coverage makes ULIP the most attractive investment option. If your return difference is even 1-2% higher in ULIPs it could make a lot of difference in the long run. Let us understand through an example – You pay a monthly premium of Rs 10,000 in a 20 year ULIP plan and suppose the plan gives annual 8% return post adjusting all charges etc. Your maturity value will be approx Rs 59 Lakhs after 20 years compared to traditional endowment plan, where you can get maximum Rs 46 Lakhs (assuming traditional plan gives a 6% maximum return).You are getting Rs 13 Lakhs more by investing in a ULIP Plan. 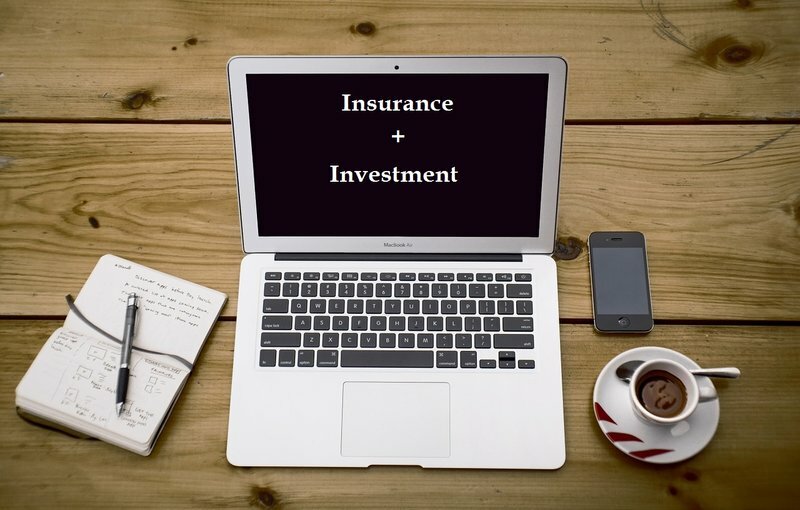 Therefore, we can conclude that the unique combination of insurance and superior investment returns makes ULIP your future safer and wealthy.